Even though I am a Valentine's -Day-Lover at heart, there are certainly a few years when I wished that the holiday didn't exist! So, when my friends over at Beauty Undercover told me about this Anti-Valentines Day themed Go! Gorgeous Sweet Revenge Kit from Skin Authority, I knew that I was going to have to check it out! Skin Authority wants you to treat yourself to some good skincare this Valentines Day. No matter if you have a honey or not, looking good and *feeling good* about yourself will give you a boost. Take care of yourself and your skin. You are bound to feel better! But, if you are out for revenge (wink, wink) or just want to make a certain someone turn their head...Isn't looking good the best way to do it? All kidding aside, this Go! Gorgeous Sweet Revenge Kit from Skin Authority skincare contains some great items! For my first impressions of this kit, please keep reading. In order to get this review posted before Valentine's Day, this is a first impressions review. Normally I test skincare out longer, but this is a Valentine's-themed product. So, I will give you my impressions as well as product information based on my initial testing and the information that comes with the kit. What is so nice about getting a skincare "kit" is that it takes much of the "guesswork" out of creating a skincare routine. All the products you need are included! Plus, detailed instructions outline your routine. Do you know what else is nice? 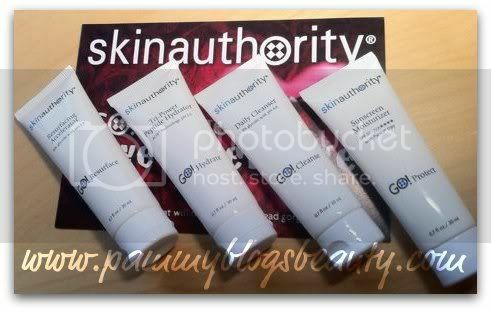 Skin Authority offers a toll-free line for skincare "coaching". They want to help you use your products and customize your routine. These products contain no dyes, parabens, no animal testing, and no added perfumes. Provides full-spectrum protection against harmful UVA and UVB exposure. 1. Wash your face using the Daily Cleanser. For best results apply to dry skin with fingertips or soft cloth. Rinse thoroughly with water. Can be used to remove makeup or shave. 1. Wash your face using Daily Cleanser. 2. Apply Resurfacing Accelerator. Using fingertips, apply a thin layer over treatment areas (avoiding eyes and eye lids). Use only at night when starting a resurfacing program or on a maintenance program. 3. Apply Tri-Power Peptide Hydrator. Smooth a thin layer over treatment areas (avoiding eyes). Daily Cleanser: This is a clear gel cleanser. Ya'll know me. I love a good unscented gel-based cleanser. So, I immediately loved this! The active ingredient is 3% Glycolic Acid. I found this cleanser to be gentle on my sensitive skin. Rinses clean with no residue. This left my skin feeling very smooth: no dry patches! This product is a thick clear "antibacterial" gel. The active ingredient is 15% Glycolic Acid. I experienced no redness nor irritation from this product. But, I think the key here is to apply a thin layer and start out your use with every-other night until you know how your skin reacts. I was a little hesitant to try this at first. But, am happy that I experience no irritation! This product contains "AOX Technology" (translation: Complex peptides and Antioxidants: Multi-peptide chain includes Oligopeptide, Tetrapeptide-7, Hexapeptide-8, Hyaluronate, Vitamins B5, B6, & E. This is a nice hydrating lotion with the added benefits of peptides and antioxidants. It is non-greasy and a nice base for makeup. I deviated from the "routine" by applying this in the morning before sunscreen *and* at night (per package recommendations). Sunscreen Moisturizer SPF 30: This is a non-greasy sunscreen lotion. It contains Vitamins B5 & E, ALoe, Algae Extracts, Avobenzone, Homostalate, Octinoxate, Octisalate, Otocrylene, and Oxybenzone. Typically I am not a huge fan of chemical sunscreens as I find them to be irritating to my sensitive skin. But, so far so good with this sunscreen. I am not experiencing the blotchy redness that I normally get with Avobenzone. But, I likely won't continue with this sunscreen long term. It does leave a bit of a glowy sheen to your skin. So far so good with this kit! The products leave my skin feeling fresh, hydrated, and protected. I will continue to use the Daily Cleanser, Resurfacing Accelerator, and Tri-Power Peptide Hydrator until it is time to test something new!